New Zealand with its capital Wellington is located in Oceania (Oceania, islands in the South Pacific Ocean). It covers some 268,839 square kilometers (almost twice the size of North Carolina) with 4,510,330 citizens. 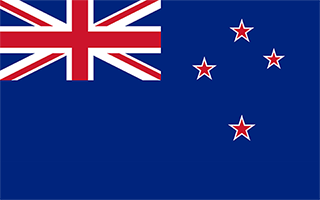 English and Maori are the common languages used in New Zealand. This country shares no land borders with another country. New Zealand is known in the native Maori language as Aotearoa, often translated as The land of the long white cloud. New Zealand is a country of stunning and diverse natural beauty which includes: jagged mountains, steep fiords, pristine lakes, raging rivers, scenic beaches, and active volcanic features. The islands are one of Earth's richest flora zones and is inhabited by some unique fauna, including many flightless birds such as the kiwi, which is the national symbol. The country is sparsely populated but easily accessible. New Zealand has modern visitor facilities, and developed transportation networks. New Zealand consists of two main islands and many smaller ones in the South Pacific Ocean approximately 1,600 km (1,000 mi) southeast of Australia. With a population of four million in a country about the size of the United Kingdom, many areas are sparsely settled. The landscape is predominately mountainous with large coastal plains. The average density of population is about 17 per km². The climate in New Zealand can be described as temperate with sharp regional contrasts. Potential threats by nature are earthquakes are common, though usually not severe, significant volcanism on North Island; Ruapehu (2,797 m), which last erupted in 2007, has a history of large eruptions in the past century; Taranaki has the potential to produce dangerous avalanches and lahars; other historically active volcanoes include and volcanic activity. To reach someone New Zealand dial +64 prior to a number. The local cellular networks are operated on 900 MHz, 1800 MHz, 3G, 4G. Websites typically end with the top level domain ".nz". If you want to bring electric appliances (e.g. battery chaarger), keep in min the local 230 V - 50 Hz (plugs: I). The sign for the locally used currency Dollar is NZD. Blue with the flag of the UK in the upper hoist-side quadrant with four red five-pointed stars edged in white centered in the outer half of the flag; the stars represent the Southern Cross constellation.